America's economic revolution isn't just driven by technology. It's about markets. The past twenty-five years have witnessed a remarkable shift in how we get the stuff we want. If you've ever owned a business, rented an apartment, or shopped online, you've had a front-row seat for this revolution-in-progress. Breakthrough companies like Amazon and Uber have disrupted the old ways and made the economy work better-all thanks to technology. At least that's how the story of the modern economy is usually told. But in this lucid, wry book, Ray Fisman and Tim Sullivan show that the revolution is bigger than tech: it is really a story about the transformation of markets. From the auction theories that power Google's ad sales algorithms to the models that online retailers use to prevent internet fraud, even the most high-tech modern businesses are empowered by theory first envisioned by economists. And we're all participants in this revolution. Every time you book a room on Airbnb, hire a car on Lyft, or click on an ad, you too are reshaping our social institutions and our lives. 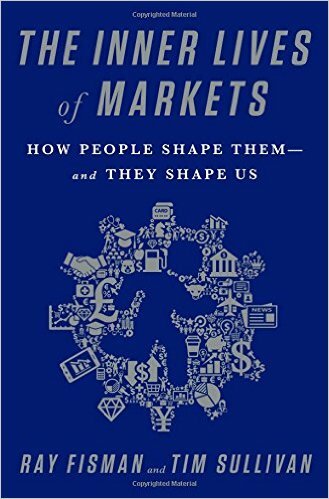 The Inner Lives of Markets is necessary reading for the modern world: it reveals the blueprint for how we work, live, and shop, and offers wisdom for how to do it better.